How Much of Making Transit Easier is Making Driving Harder? Advocates of alternative transit are often trying to lobby for new infrastructural systems so that increased access can create opportunities for a new rider base that move away from relying solely on automobiles. In designing a pedestrian-oriented space, success not only comes from making pedestrian access an easier, but making it the easiest. The same can be true for all modes of transit. Reaching parity with cars in terms of convenience isn't always enough to alter people's use patterns. Sometimes this could mean not just opening up new avenues for transportation, but constricting old ones as well. Years ago I was part of a design team working on a master planning effort for an organization located in Syracuse, New York. The city was once connected by a mature network of streetcars that stretched among the suburbs, the University and the downtown. However, now Syracuse is a city much like other post-industrial American cities that relies on an automotive culture in order to function. The stark lack of alternative transit options stem largely from empty municipal coffers from decades of depopulation combined with a cold season that, to put it mildly, could be characterized as inhospitable. The result is that 25% of the acreage of the downtown is surface parking lots, all but decimating most opportunities for pedestrian culture. Taking the parking lots away could mean having less cheap parking for commuting workers. It also means that any expansion in jobs for the city would likely only increase car traffic, most likely prompting the city to expand road and parking capacity. I vividly remember reading through some summary reports of local traffic engineering studies in the hope that they could inform our current planning effort. The report highlighted the nature of car infrastructure in this country: a vicious cycle of self-fulfillment that always ends with the need for larger roads. 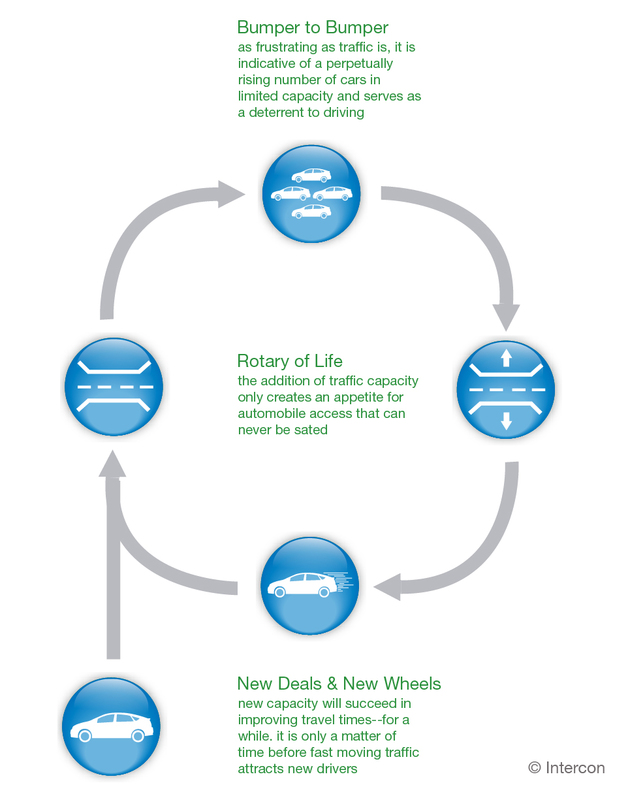 History shows us that expanding car capacity is usually a temporary solution in a cyclical process. When traffic reaches problematic levels, authorities respond by adding capacity to the existing system, such as widening the roads. This effort succeeds in relieving traffic congestion, which in turn makes driving more desirable. 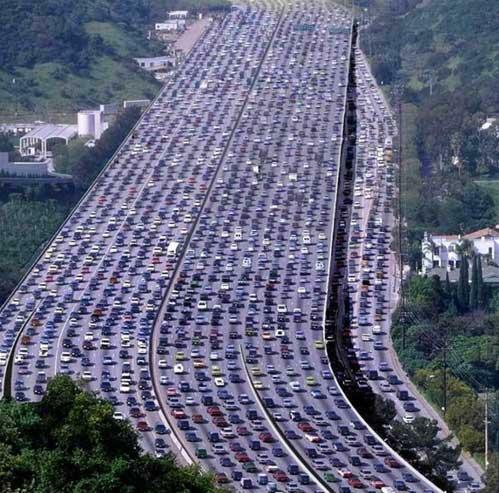 With lower chances of being stuck bumper-to-bumper, new drivers are enticed to make commutes, which eventually fills the new capacity and creates traffic. Thus the process starts again. Looking at a city like Boston, the area is notorious for highway traffic and currently waist-deep in the process of widening arterial Route 128 to improve the flow of traffic in and out of the city. This is a program that was originally expected to cost $50 million and now is closer to $350 million (what is becoming a familiar symptom of inflation for Boston transit projects) and still not done. At the same time, the city has attempted improvements to a number of its alternative transit systems such as the "T" (subway) or commuter rail. The city's parallel expansion of car and transit infrastructure could be seen as two opposing initiatives. If moving people in and out of the city is the goal then perhaps siphoning cars in and out is not the best method (especially for a city already strapped for parking spaces). Assuming systems like the T are not at capacity already, one has to wonder what will encourage more migration from driving: making the T easier or making driving more difficult. New York seems to understand this well (at least its current administration). Years ago, rather than relieving congestion in Lower Manhattan by adding more vehicular access, the Bloomberg administration vied for introducing a Congestion Pricing program to increase the cost of driving into the lower half of the city during certain hours of the day. After all, what would we need more cars on the island for anyway? The effort failed to get state-level approval, but Mayor's office found plenty of opportunities to make progress in the meantime. 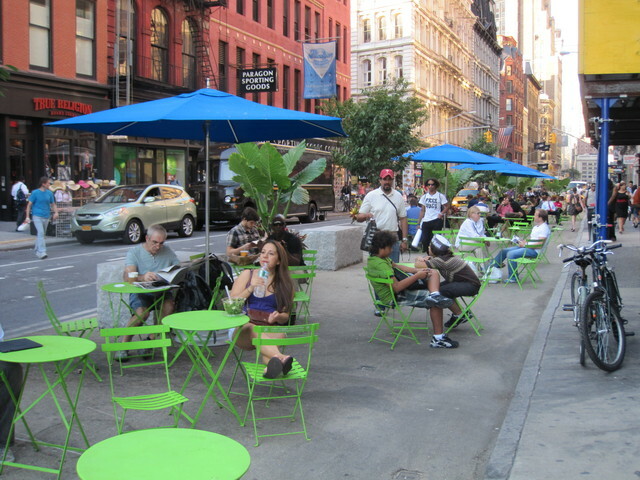 The renovations done to the series of urban squares along Broadway are designed to cater to pedestrians, creating more space for both walking as well as plazas with planters, tables and chairs. The city has also installed 350 miles of new bike lanes throughout the grid. Both of these things effectively remove lanes from car access and give them to other modes of transit. Even the city's new bike sharing program required docking stations to claim a number (albeit small) of the streets' coveted parking spaces. These kinds of projects point to an evolving urban street grid, a process that could continue to make the entire ecology of alternative transit more attractive than traversing the city by car. Even in my visits to European cities, the fortitude of their pedestrian activity is fed by the fact that making the same trip by car would be cumbersome. Roads are tighter. Parking is scarce. Pedestrian thoroughfares are strengthened with public spaces and active retail sidewalks to only improve the walking experience. Walking or biking simply makes more sense. On the contrary, if roads are open seas of pavement, parking was bountiful and in expensive, development was spread out over miles and streetscapes were devoid of parks and businesses, why wouldn't one drive? At a certain point, it's hard to blame Americans for being so bound to their cars when the very design of our communities all but mandates their use. If parts of the country have a goal of truly becoming less car-centric, then adding new transit options may not be enough to instigate change in our cultural norms. Part of the equation may be removing lanes of traffic, raising the price of parking or trading vehicular boulevards into walking markets. Nothing gets people on their bike like the prospect of waiting in traffic for 15 minutes to go get a coffee down the street. Maybe we just need more traffic?